Feed birds from all four sides. Clear plastic side plates show level of feed and can be removed for cleaning. Hinged roof opens for easy re-filling. Holds 10 pounds of feed. All patterns drawn FULL SIZE. Measures approximately 19"H x 14" square. The #5059 Farm House Bird Feeder Hardware includes hinges, clear plastic plates, spindles, hooks & eyes, and white plastic windows & doors. Project plan, remaining wood and wood finish not included. 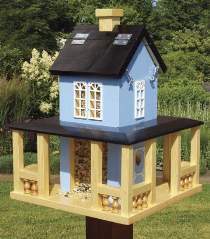 Plan and hardware kit available separately or save by ordering the #5060 Farm House Bird Feeder Special which includes #W3578 Farm House Bird Feeder Plan and one #5059 Farm House Bird Feeder Hardware.